Broadband access technology is surging, and it is destined to become a battlefield where smoke will never dissipate. At present, the mainstream in China is still ADSL technology, but more and more equipment manufacturers and operators have already. I turned my attention to optical network access technology. Copper prices continue to rise, cable prices continue to decline, and the growing demand for IPTV and video game services is driving the growth of FTTH. The replacement of copper cables and wired coaxial cables by optical cables has made the beautiful prospects of triple play of telephone, cable TV and broadband data clear. The PON (Passive Optical Network) passive optical network is the main technology for implementing FTTH fiber-to-the-home. It provides point-to-multipoint fiber access. It consists of the OLT (optical line terminal) on the office side and the ONU (optical network unit) on the user side. ) and ODN (Optical Distribution Network). Generally, the downlink adopts TDM broadcast mode, and the uplink adopts TDMA (Time Division Multiple Access) mode. A point-to-multipoint tree topology. The biggest highlight of PON as optical access technology is “passive”. The ODN does not contain any active electronic devices and electronic power supplies. All of them are composed of passive components such as splitters, which have low management and operation costs. The PON technology research originated in 1995. In October 1998, the ITU adopted the ATM-based PON technology standard G-983 advocated by the FSAN organization (full service access network). Also known as BPON (Broadband PON). The rate is 155 Mbps and can optionally support 622 Mbps. EFMA (Ethernet in the First Mile Alliance) introduced the concept of Ethernet-PON (EPON) at the end of 2000 with a transmission rate of 1 Gbps and a link layer based on a simple Ethernet package. GPON (Gigabit-Capable PON) was proposed by the FSAN organization in September 2002. In March 2003, the ITU adopted the G.984.1 and G.984.2 protocols. G.984.1 specifies the overall characteristics of the GPON access system; G.984.2 specifies the physical medium correlation sublayer of the ODN (Optical Distribution Network) of GPON; in June 2004, the ITU passed G.984.3, which The requirements for the Transmission Convergence (TC) layer are specified. EPON provides fixed uplink and downlink 1.25 Gbps, 8b/10b line coding, and an actual rate of 1Gbps. GPON supports multiple speed grades, can support uplink and downlink asymmetric speed, downlink 2.5Gbps or 1.25Gbps, uplink 1.25Gbps or 622 Mbps, determine the uplink and downlink speed according to actual needs, select the corresponding optical module, and increase the optical device speed price ratio. . Conclusion: GPON is better than EPON. The split ratio is how many ONUs (users) are carried by one OLT port (office). The EPON standard defines a split ratio of 1:32. The GPON standard defines the split ratio as follows: 1:32, 1:64, 1:128. In fact, the technical EPON system can also achieve higher split ratios, such as 1:64, 1:128, EPON control. The protocol can support more ONUs. The split ratio is mainly limited by the performance index of the optical module. The large split ratio will cause the cost of the optical module to rise significantly. In addition, the PON insertion loss is 15~18dB, and the large split ratio will reduce the transmission distance; too many users share Bandwidth is also the price of a large split. Conclusion: GPON provides multiple selectivity, but the cost consideration is not obvious. The maximum transmission distance can be supported by the maximum physical distance of the GPON system. When the optical split ratio is 1:16, the maximum physical distance of 20km should be supported. When the optical split ratio is 1:32, the maximum physical distance of 10km should be supported. EPON is the same, this conclusion: equal. EPON Ethernet packet header in the MAC layer increased by 64 bytes of MPCP multi-point control protocol (multipointcontrolprotocol), MPCP message, state machine and timer to control access to P2MP point to multipoint topology, the DBA dynamic bandwidth allocation.MPCP covers the allocation of the ONU's transmission slots, the automatic discovery and incorporation of the ONU, and the reporting of congestion to higher levels to dynamically allocate bandwidth.MPCP provides basic support for P2MP topology architecture, but there is no classification of business priorities in the protocol. All businesses compete for bandwidth randomly, while GPON has more sophisticated dbas and excellent QoS service capabilities. GPON divides business bandwidth allocation into four types, with priority from high to low being Fixed bandwidth, Assured bandwidth, non-guaranteed bandwidth and maximum bandwidth. The DBA defines traffic container, t-cont, as the upstream traffic dispatch unit, and each t-cont is identified by alloc-id.Each t-cont can contain one or more GEM port.t-cont can be divided into five business types. Different types of t-cont have different bandwidth allocation methods, which can meet the QoS requirements of different business flows such as delay, jitter and loss rate.T-cont type 1 is characterized by Fixed bandwidths and Fixed bandwidths. It is suitable for time-delay sensitive businesses, such as voice business.Type 2 is characterized by fixed bandwidth but uncertain time slots, which are allocated according to guaranteed bandwidth (Assured). It is suitable for fixed bandwidth business with low requirements for jitter, such as video on-demand business.Type 3 is characterized by minimum bandwidth guarantee, dynamic sharing of spare bandwidth, and maximum bandwidth constraint, and allocation of non-guaranteed bandwidth, which is suitable for businesses with service guarantee requirements and high sudden traffic, such as download business.Type 4 is characterized by maximum effort (BestEffort), no bandwidth guarantee, and is suitable for businesses with low delay and jitter requirements, such as WEB browsing business;Type 5 is the combination type. After allocating guaranteed and non-guaranteed bandwidth, additional bandwidth requirements are allocated to the best of their ability. EPON does not give much thought to OAM, but simply defines remote failure indication, loop back and link monitoring for ONT, and is optional support. GPON in the Physical Layer defines the PLOAM (Physical Layer OAM), high-level defines the OMCI (ONT Management and Control Interface), manage the OAM at multiple levels. PLOAM used to implement the function such as data encryption, state detection, error monitoring. OMCI channel protocol used for high-level definition of business Management, including the function of the ONU parameter set, T - CONT types and volume of business, QoS parameters, request configuration information and performance statistics,Automatic notification of system running events to achieve the configuration, fault diagnosis, performance and security management of ONT. EPON follows the simple Ethernet data format, only adding 64 bytes of MPCP point to multipoint control protocol in the Ethernet packet head to realize the bandwidth allocation, bandwidth rotations, automatic discovery and ranging in EPON system.There has not been much research on the support of services other than data services (such as TDM synchronization services). Many EPON manufacturers have developed some non-standard products to solve this problem, but none of them are ideal, and it is difficult to meet the requirements of telecom level QoS. GPON is based on the completely new transmission fusion (TC) layer, which can adapt the multi-business of high level. ATM packaging and GFP packaging (general frame protocol) are defined, and one of them can be selected for business packaging.In view of the fact that ATM applications are not popular, a gfp-only packaged GPON lite device emerged, which removed ATM from the protocol stack to reduce costs. GFP is a generic link layer discipline that applies to multiple businesses. ITU is defined as g.7041.In GPON, GFP was modified slightly. Port ID was introduced in the head of GFP frame to support multiport reuse.A Frag (Fragment) segment indicator was introduced to increase the effective bandwidth of the system.Moreover, it only supports data processing mode oriented to variable-length data, but does not support data transparent processing mode oriented to data blocks. GPON has strong multi-business carrying capacity.The TC layer of GPON is synchronous in nature, using standard 8kHz (125 aerobm) length frames, which enables GPON to support end-to-end timing and other quasi-synchronization businesses, especially TDM business, which is called NativeTDM. GPON has "natural" support for TDM business. Conclusion: the TC layer of GPON support for multiple businesses is stronger than the EPON MPCP. EPON and GPON are different, and GPON is superior to EPON in terms of performance indicators, but EPON has advantages in time and cost, and GPON is catching up. Looking ahead, the broadband access market in the future may not be replaced by others, but should be coexisting and complementary.For bandwidth, multi-business, QoS and security requirements and ATM technology as backbone customers, GPON will be more suitable.For the client group that is cost sensitive, QoS, security requirement is not high, EPON becomes dominant. 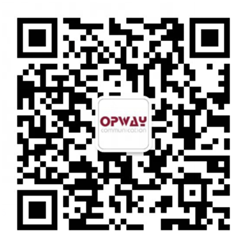 Shenzhen Opway Communication Co., Ltd. specializes in producing EPON and GPON series of optical modules.